Blackjack is one of the few casino classics that require not only luck but also skills. The fact that its outcome can be influenced by using a reliable strategy attracts a number of players as it gives them the chance to improve their game. In blackjack, knowledge can really make the difference between winning and losing and this is the reason why it is essential to be familiar with the basic rules and strategy. Throughout the years, a great deal of extensive surveys has been conducted in an attempt to figure out its odds. Since blackjack is a card game, it is possible to determine to some extent the pattern the card follows and the likelihood of getting certain combinations. The probability of winning can be also calculated quite accurately, taking into account the players’ hand and the dealer’s up card. It is extremely important to get familiar with the odds and probabilities of blackjack as well as with its house edge in order to get a general idea of the game. If players want to become consistent winners, they should be aware of the likelihood of getting blackjack or busting. The odds of a particular casino game are usually measured in percentage which makes them easy to understand. Their main purpose is to determine the players’ chances of winning or losing a particular hand by taking into account a number of aspects. One of the important things that gamblers should remember is that even the smallest rule change can make a huge impact on the game. Every adjustment directly influences players’ chances of winning and therefore, it is essential to be familiar with the most beneficial variations in order to be able to get the most out of every game. By getting acquainted with the odds of the game, players automatically increase the possibility of making the best move in a certain situation. The reason why is simple – since they have a general idea of what cards occur frequently, they can make better decisions which are in accordance with this valuable information. In general, players are bound to lose in the long term, providing that they don’t use a strategy and rely solely on their luck and odds. In order to achieve the desired win, they should take their time to develop their skills and learn as much as possible about the game. One of the most important things that players need to get familiar with before playing is their odds of going bust. Since the main objective of the game is to reach 21, without surpassing it, it is essential to know when it is best to avoid hitting. Even though players should follow the basic strategy in order to make the best possible moves, it is also very important to be aware of their mathematical chances of losing. Thus, let’s have a look at the following chart which illustrates the odds of going bust, providing that players have chosen to hit. The chart takes into account only the total value of player’s hand and according to it, calculates the likelihood of busting. It can be very helpful and efficient as it provides players with valuable information about their chances of losing. At the beginning of every game, players are dealt two cards which form their hand value. Since the standard pack of cards consists of 52 cards, 13 ranks and 4 suits, it is possible to predict the odds of getting a particular combination. Thanks to these findings, players have the chance to get an overall idea of how frequent they can form a natural blackjack or a soft hand. They will be able to grasp the fundamental principle of blackjack better and find out the exact percentage of getting any of the different hand categories. 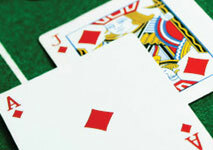 Natural blackjack or in other words, an Ace and a 10-valued card occurs 4.8% of the time. It is the most desirable hand and as such, it shouldn’t be a surprise that it is hard to get it. The second best combination that players can get is a hard standing hand as its total value is usually enough to beat the dealer. The following chart has proven to be very useful as it provides valuable information about the possibility of getting a certain combination. It is no secret that every casino game, including blackjack, has a built-in advantage as this is the reason why the casinos offer such gaming products in the first place. The house edge is a rather dynamic measurement as it depends on many factors such as the number of the decks involved in the game and the specific version. Blackjack is famous for having a very low house edge – around 1% which can be reduced even more if players apply a strategy correctly. In general, the casino games that require skills and knowledge are the ones that have the lowest house edge as their outcome can be influenced. Blackjack is one of the most played casino games and as such, it shouldn’t be a surprise that it has numerous variations. Every version gives players different chances of achieving the desired win as some variations offer more favorable rules and odds than others. 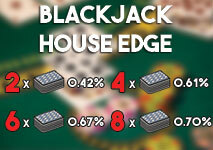 For instance, the house edge of the popular version Super Fun 21 is 0.94%, whereas in Blackjack Switch it’s only 0.17%. The rules of the respective game differ from one casino to another which is the reason why it is important to consider them beforehand. In blackjack, the number of the decks included in the game plays a crucial role as it directly influences the odds of winning. In the past, it was mainly played with a single pack of cards, however nowadays it is extremely hard to find such a game. Therefore, players should get familiar with the house edge each variation provides them with as it determines to a huge extent their chances of making a profit. The number of decks is also essential for card counters as if the game is played with eight decks it is extremely hard to keep track of the cards properly. It is worth noting that the more decks are used, the higher the house edge is. For instance, if players play with two decks, the house edge is 0.42% but if the game involves eight decks – 0.70%. One of the reasons why blackjack is so wildly popular is that it offers players moderately good chances of winning as its house edge is less than 1%. Since its odds can be calculated to a huge extent, it is possible to determine the likelihood of getting a certain card combination. Blackjack is a game of both skill and pure chance which enables players to influence the outcome of every hand by utilizing a reliable strategy. It is extremely important to know the situations in which it is a good idea to increase the amount of the bet as this way players have higher chances of winning more.